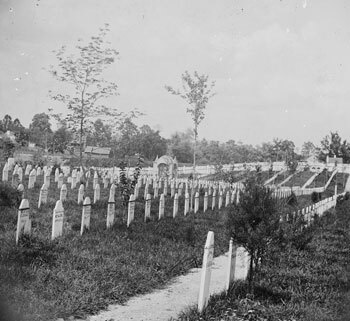 Although several cemeteries were established during the Civil War, the War Department had done only limited long-term planning until the passage of the National Cemeteries Act in 1867, which specified the construction of permanent lodges for the cemetery superintendents, masonry walls, and marble headstones. Over the course of the next 20 years, the U.S. Army oversaw the acquisition of land, the design of the cemetery, the reinterment of the dead from shallow battlefield burials or hospital cemeteries, the construction of roads, walls, lodges and utility buildings, the planting of trees and plants, and the acquisition and installation of permanent headstones. It was a remarkable undertaking by the Army, which was committed to ensuring that the remains of an estimated 300,000 Union dead were buried with dignity and honored in perpetuity by placement in a national cemetery. While the War Department developed designs for permanent features, it erected temporary wooden structures through the early 1870s to support daily operations in the cemetery. These included picket fences and wood-framed entrance arches bearing the cemetery's name, “cabins” for the superintendent to occupy, and decay-prone headboards. Woefully inadequate, this first generation of construction was gradually replaced by permanent features starting in the early 1870s and continuing through the 1880s. 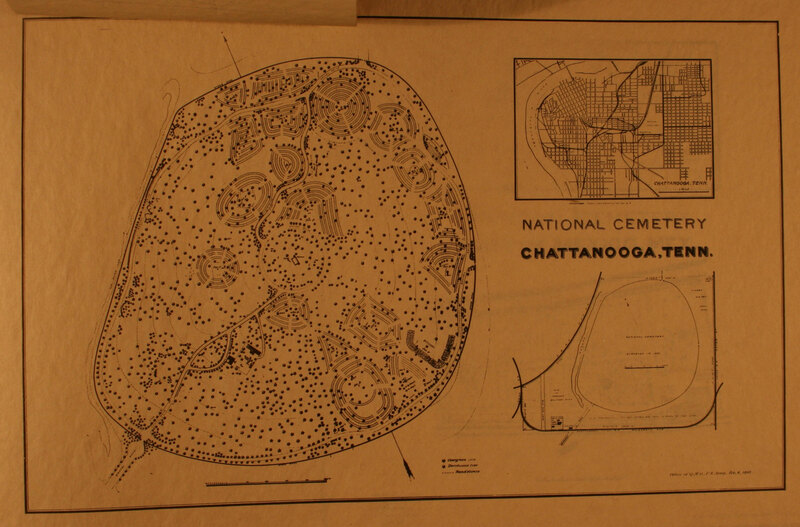 Permanent features made of brick or stone became the norm as national cemetery designs became more standardized. Almost all of the national cemeteries contained a lodge that served as a residence and office for the superintendent, as well as a few utilitarian buildings; a perimeter wall lined on the interior with the prickly Osage-orange (Maclura pomifera) bush and with both formal and service entries; and a centrally located flagpole. Over the years, cast-metal signs with the number of dead (known and unknown), rules of behavior, and lines from the popular poem “Bivouac of the Dead” were installed at each cemetery. 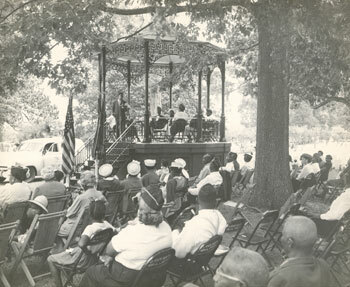 Covered octagonal or rectangular rostrums were built for speakers at ceremonies on Decoration Day, the original name for Memorial Day, celebrated on May 30th since 1868. Memorials and landscape features of all sizes, materials and forms, including inverted cannons, pyramids of cannon balls, obelisks, and statues were dedicated in honor of the dead. By 1920, approximately 125 memorials had been erected within the 80 national cemeteries established by that time. 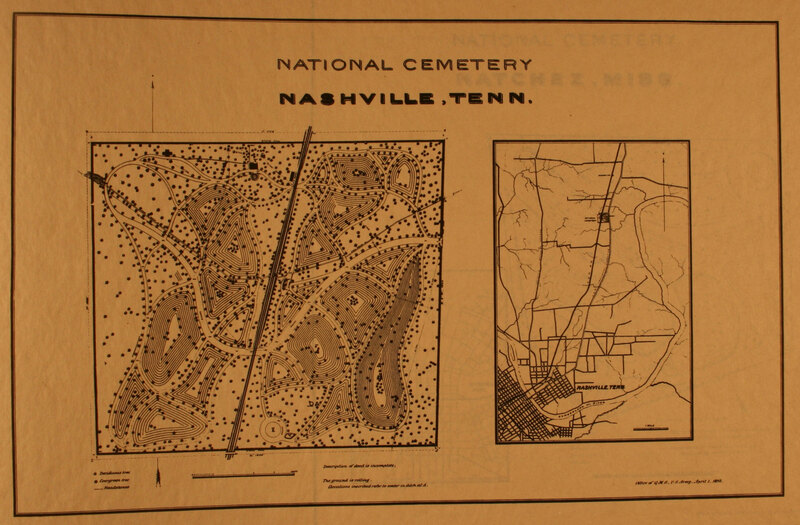 In April 1869, Brevet Major Whitman, the Army’s Superintendent of National Cemeteries, offered four “principles which should govern the selection of national cemetery sites” that would reinforce the potential for them to become historic attractions as well as shrines. These principles included localities of historical interest, convenient access, placement on the great thoroughfares of the nation, and places presenting favorable conditions for ornamentation – so that surviving comrades, loving friends, and grateful states might be encouraged to expend liberally for such purposes. Perhaps the most memorable national cemetery feature are the rows of standardized white marble headstones. In 1873, the Secretary of War designated a cambered or slightly arched marble rectangular headstone set upright for identified remains, with the individual’s name and military unit inscribed on the front side. Burials of unidentified remains were marked by a low marble block. The Army created these homogenized designs at the same time it was standardizing its design of military buildings, barracks, and quarters for all its posts. 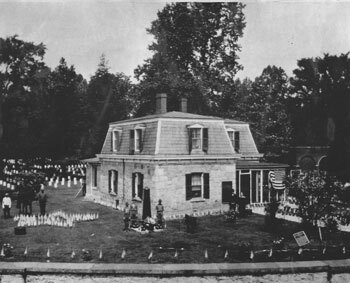 For the cemetery's superintendent's lodge, the office of the U.S. Quartermaster General under the supervision of Montgomery C. Meigs prepared standardized plans. Designed in an elegant French Second Empire style with a mansard roof, the small lodges were a prominent element at the main entrance of more than 50 cemeteries. The pattern of burials in a large number of cemeteries followed a geometric plan suitable for level ground, despite often-undulating topography. The view of the regular rows of headstones recalled the layout of the tents in many Army camps and caused an immediate evocation as a “bivouac of the dead.” Geometric layouts featured squares, rectangles, circular, and orthogonal patterns defined by roads and footpaths. 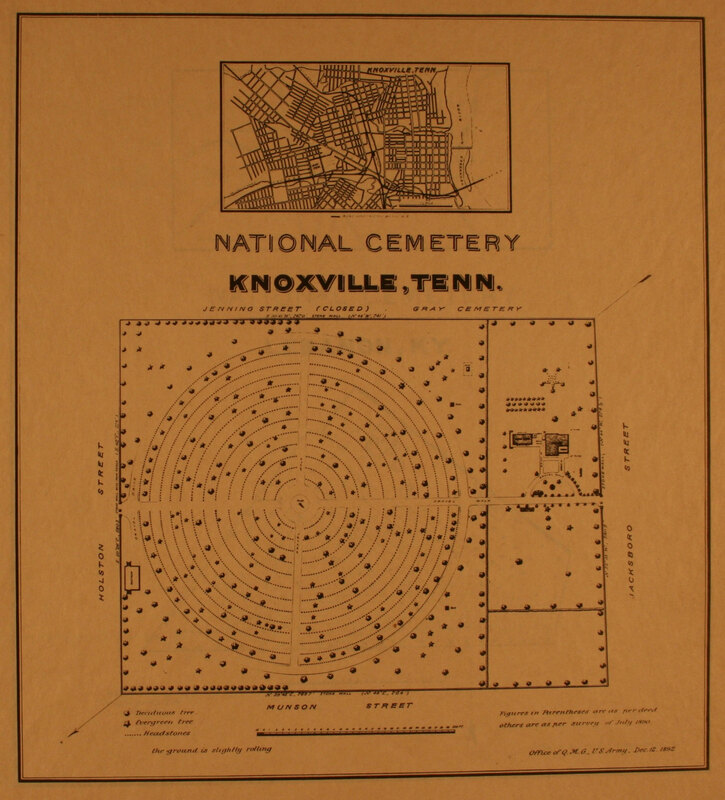 Graves were arranged in concentric circles around the central flagstaff mound, as seen at the Knoxville, TN, and Glendale and Poplar Grove, VA, cemeteries. 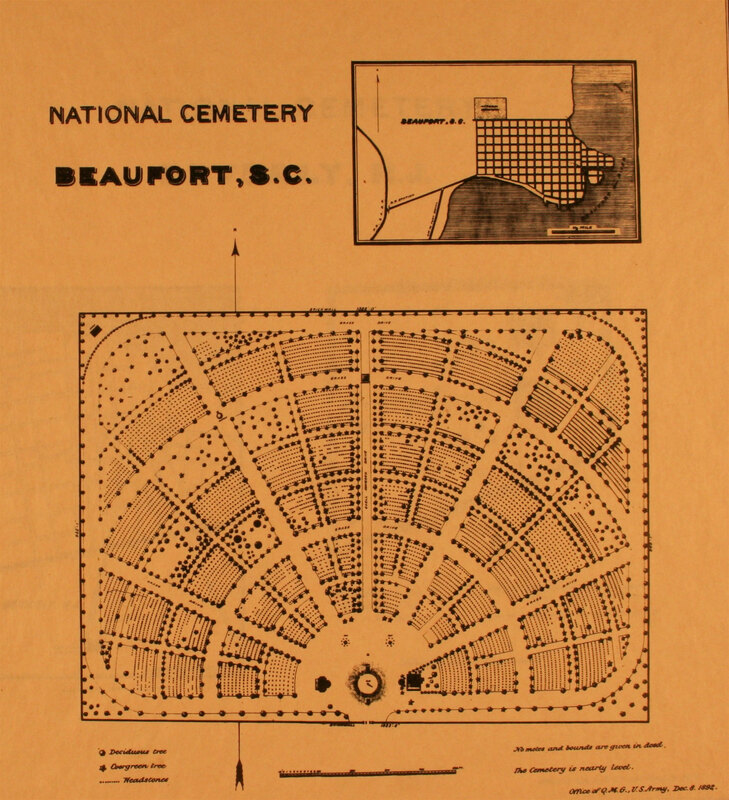 The Beaufort, SC, cemetery features a “half-wagon-wheel” layout. More complicated was the elaborate compass-rose plan seen at Fayetteville, AR. 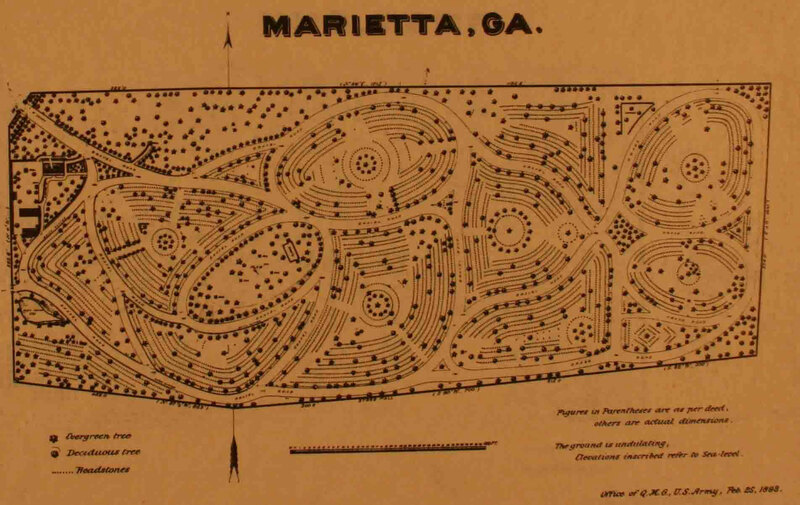 Although most national cemeteries averaged ten acres or less, they were still able to evoke the precision and patterns associated with the military in their layout. 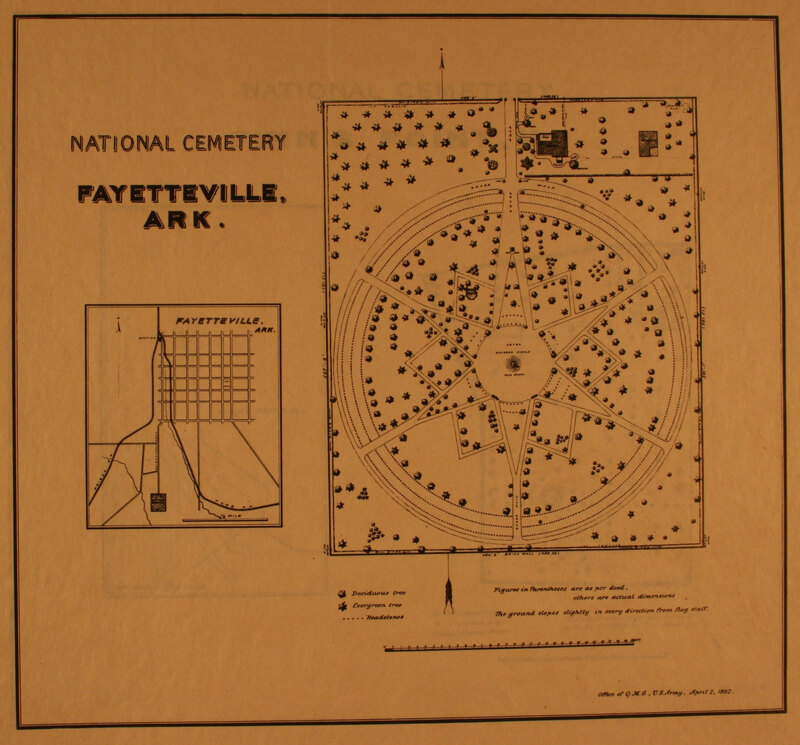 In contrast, early cemeteries established under Brevet Major Whitman’s principles in Tennessee, Mississippi, and Georgia had plans that met more aesthetic objectives. They contain four of the five monumental gates built in the national cemeteries starting in 1879. As reported in a local newspaper, the 32-foot tall Chattanooga archway, “by its immensity, Roman in character, in its architecture, military, conveys the very idea in itself that it stands as a monument over the country’s dead.” Besides the monumental arched gateways, the cemeteries at Chattanooga and Nashville, TN, and at Marietta, GA, also featured picturesque layouts that adhered to the natural, gentle contour of the slopes; this contrasted sharply with the rigid geometric layouts found in other cemeteries. Hardwood trees were planted or preserved to assure shade from the hot southern sun. 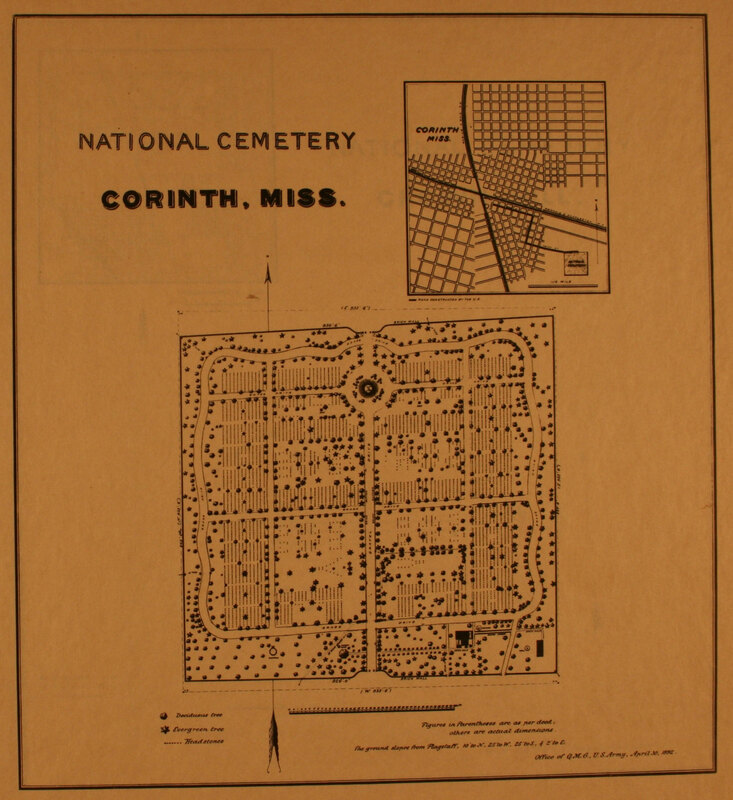 At Corinth National Cemetery, although the more traditional geometric layout of burials was followed, a 16-foot wide serpentine avenue was planned for the perimeter. Paths in many cemeteries were allowed to green over, or become grassy, for the visual effect, as well as for the comfort of its visitors and the easy maintenance of the grounds. As early as 1870, U.S. Quartermaster General Montgomery Meigs contacted the noted landscape architect, Frederick Law Olmsted, for advice on plantings. Olmsted and his partner, Calvert Vaux, had designed Central Park in New York City in 1858 and following the war were working on the landscape plan for Prospect Park in Brooklyn. During the Civil War, Olmsted had seen firsthand the wounded and the dying as the executive secretary of the U.S. Sanitary Commission, a private organization that was the precursor of the Red Cross. 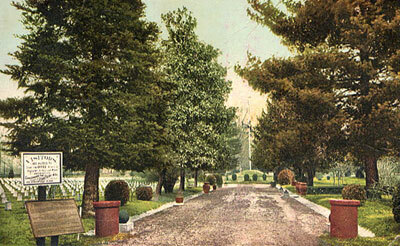 Olmsted recommended that the cemetery designs “establish permanent dignity and tranquility . . . a sacred grove, sacredness and protection being expressed in the enclosing wall and in the perfect tranquility of the trees within.” Within a few years, when funds became available for landscape improvements, Meigs issued his “Instructions Relative to the Cultivation and Care of Trees in the National Cemeteries.” He recommended the planting of “cherries and pears, walnuts and hickory-nut trees” for their “well-proportioned and graceful sizes and shapes.” Meigs’ instructions also called for “climbers about the lodge” and “ornamental shrubbery.” Visual evidence confirms that many national cemeteries were densely planted and achieved Olmsted’s “sacred grove” concept. Some cemeteries, including those in Chattanooga, TN and Alexandria, VA, planted flowerbeds depicting both the patriotic initials “US” and the Army Corps badges, but these ephemeral features have not survived. 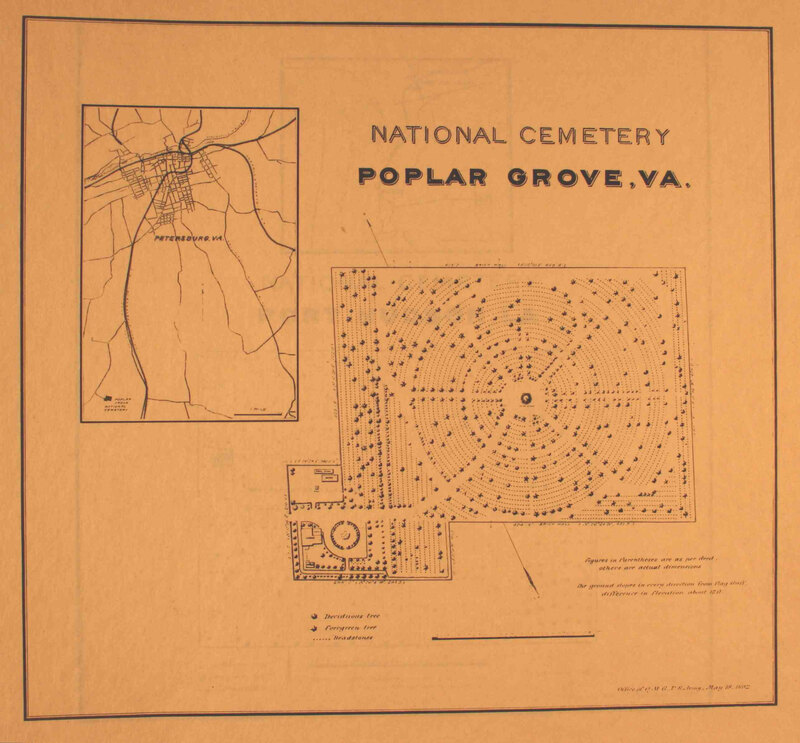 Throughout the remainder of the 19th century and up to World War I, national cemeteries saw a number of improvements to the roadways approaching and within the cemeteries, as well as with the construction of rostrums and service buildings on the cemeteries' grounds. Between the two World Wars, the Army established seven new cemeteries, some at existing facilities and others in new locations, to serve large populations of veterans. These properties were substantially larger than the Civil War-era cemeteries and three—Golden Gate, CA; Fort Snelling, MN; and Long Island, NY—reflected grand classical symmetry in their plans. The Fort Rosecrans, CA, and Forts Sam Houston and Bliss, TX, national cemeteries invoked local Spanish architectural traditions in their buildings' designs. The pressure on active sites to remain open and accommodate additional burials was so great that any viable open area, such as buffer strips along walls, road curbs, and paths, had to be utilized. The filling of these open spaces eroded the integrity of the original 19th-century historic landscapes. During the next two decades, the Army had limited interest in operating the aging cemetery system. Only after 1973, with the transfer of most of the national cemeteries to the Veterans Administration (now the Department of Veterans Affairs), were new properties acquired and older sites reactivated through expansion. Today, our national cemeteries reflect both our attitude toward proper burial and our belief that all national cemeteries are hallowed grounds in which veterans’ sacrifices should be revered.